German physician and author; born in Mecklenburg, 1808; died at Paris June 21, 1872. He graduated as M. D. at Halle, later going to France, where he became hospital and forensic physician at Bordeaux. In that city he was a member of several societies for the promotion of the public good. The last years of his life were spent at Paris. 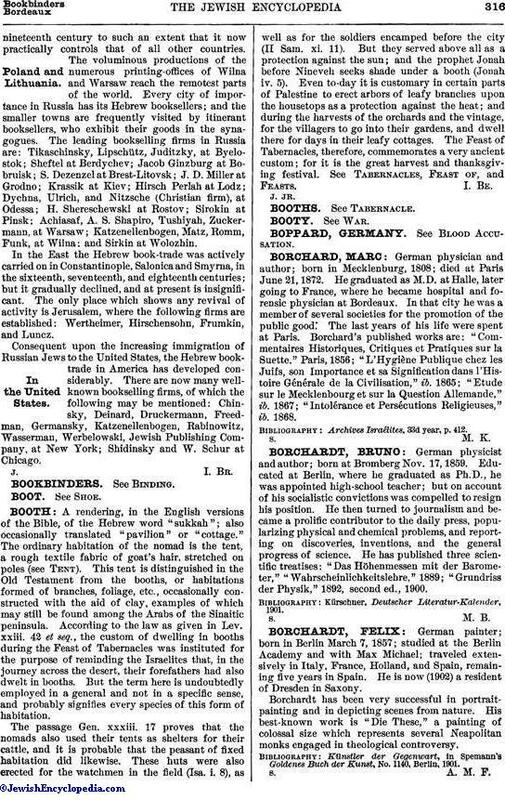 Borchard's published works are: "Commentaires Historiques, Critiques et Pratiques sur la Suette," Paris, 1856; "L'Hygiène Publique chez les Juifs, son Importance et sa Signification dans l'Histoire Générale de la Civilisation," ib. 1865; "Etude sur le Mecklenbourg et sur la Question Allemande," ib. 1867; "Intolérance et Persécutions Religieuses," ib. 1868. Archives Israélites, 33d year, p. 412.